DANOBAT-OVERBECK, part of the DANOBATGROUP, has developed a new solution for high-precision and flexible external and internal grinding and threading, called ID-400 L. This innovative equipment is specifically geared to spindle shafts, tool adapters and spindle housings. This grinding machine, designed in Herborn (Germany), can be used on workpieces with a maximum length of 1,300 mm (with a longitudinal OD/ID of 280 mm). Grinding diameters of 400 mm on workpieces weighing as much as 350 kg is also possible. With a long-standing track record of over 90 years in developing internal and external cylindrical grinders to the highest quality standards, the brand has exploited its expertise to design this new equipment with perfect vibration damping and excellent thermal stability thanks to its natural granite bench and cooling system for the workhead and X and Z axes. In addition, the device offers high accuracy thanks to the linear motor technology on the X and Z axes as well as maximum static and dynamic stability through amply dimensioned slide units with linear motion roller guides. Positioning on the grinding machine is by means of absolute linear scales, direct drive workhead spindle (C0 axis) with preloaded precision bearings and variable speed adjustment from 0-1,000 rpm. The machine is also equipped with a high precision swivelling workhead (B-axis), a rotary spindle turret for greater versatility with an option to integrate up to 4 spindles, a direct drive torque motor and a measuring system with a high-resolution encoder of 0.0001°. A Siemens Sinumerik 840D SL with Safety Integrated CNC unit and Windows-based software for quick and easy reference change are used. 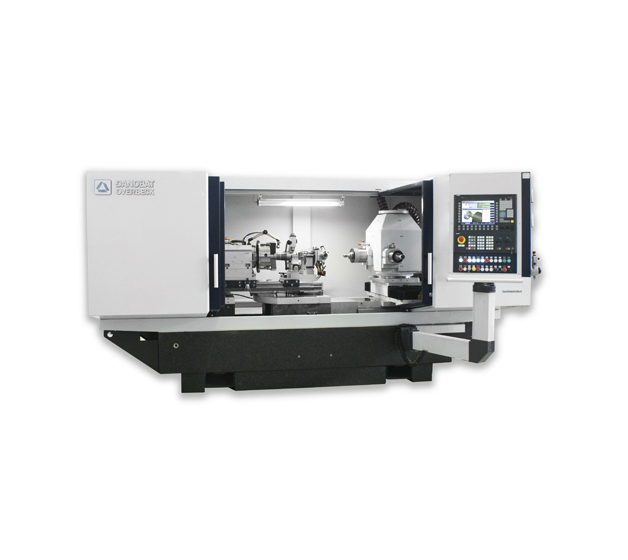 Another feature of the ID-400 L is its highly modular design, which enables every customer to configure a machine that meets his individual needs: a variety of grinding spindles, diamond-dresser configurations, workpiece clamping systems and several options for measuring tools and customisation of measuring cycles among other possibilities.